The most famous stories about conscription in Great War Britain are those of Conscientious Objectors. As with any other group, their stories varied enormously, as the stories of three men who ended up in the Non-Combatant Corps: A.J. Munro, W. Cooper and A.J. Elsdon. 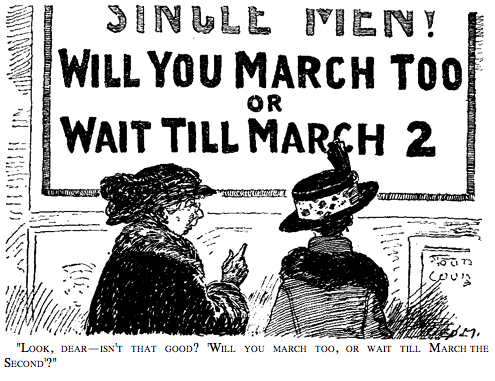 When compulsory military service was introduced in 1916, men were entitled to claim conscientious objection to military service. This was an option refused to conscripts in other countries (including France), but it was widely seen as an option taken by ‘shirkers’ and cowards who simply did not want to fight. After 18 months of war and ceaseless calls for more men, it was hard for many people (including many tribunal members) to believe that anyone could not want to fight for their country if they were fit and able. The phrasing of the section on conscientious objectors (COs), which bears the hallmarks of a late inclusion in the text, led many to misunderstand what was allowed. The Act was supposed to offer absolute, conditional or temporary exemptions to COs, with an additional option of non-combatant service. The phrasing, though, could easily (if perhaps willfully) be misread as suggesting that only non-combatant service was available to COs. Many tribunals, unsure of how to judge the validity of philosophical objections to war, opted for the non-combat route as one that seemed suit everyone: they got rid of the CO, the CO was not forced to take part in combat, and the military got an extra soldier. However, it was not so simple: many objectors objected absolutely to military service and refused to take up even non-combatant service. Walthamstow clerk Arthur James Elsdon was called up in the summer of 1916 at the age of 21 and claimed a conscientious objection to military service. When he was enrolled in the army, he refused to sign his service papers. He was allocated No 4 Eastern Company on 15 June, and on the 23rd was tried to 112 days hard labour. It is not clear from his service papers what he had done wrong, but it is likely that he was refusing orders from superiors, as many absolutist COs did. In September, Elsdon was transferred to the army reserve. Elsdon refused to sign his service papers. In early 1917, the authorities decided to put Elsdon to work and he was ordered to work at Messrs Bibby’s, a large oil mill in Liverpool. On 31 March 1917, though, having not arrived in Liverpool he was recalled to the army; since No 4 company was in Ireland, he was ordered to report to No 10 company at Gravesend on 6 April. Eldson wrote to the War Office asking whether this was right, as his unit was No 4. He also told them that he was in correspondence with an MP about the Home Office employment schemes that were, by then, being used to occupy conscientious objectors who refused to serve in the armed forces. Elsdon never arrived at Gravesend. A policeman called at his father’s house in Westbury Road, Walthamstow, where he heard that Arthur had called at the house on the 6th (presumably the day he wrote the letter) but disappeared – the house was kept under observation but no sign of the young man was forthcoming. Eventually, he was apprehended in March 1918 and sentenced to two years’ hard labour. William Cooper, a coffin-maker from Barking, also ended up in jail. His route was slightly different, though. Although his faith as a member of the Plymouth Brethren meant that he was opposed to military service, his father made an appeal to the local tribunal on the basis of William being indispensable to their business. A tribunal hearing on 16 June 1916 accepted this reason and exempted him, although another in October made it conditional on joining the St John’s Ambulance, which Cooper promptly did. On 21 December, it was announced that being an undertaker was no longer deemed work of national importance. In March, Cooper’s exemption was upheld, only to be cancelled in April. At a hearing on 24 April 1917, he told the tribunal of his conscientious objection but it was rejected as having been formed since the start of the war (which was not a valid ground for exemption) because it had not been part of his previous appeals. Through April and May he wrote to the War Office and to David Lloyd George about his case: that his father had made the previous appeal and ignored his conscientious objection. Different again was the story of Andrew John Munro, a schoolmaster from Enfield, who appeared before Croydon tribunal on 3 March 1916. Oddly, Munro had been previously served in the 20th London (the Blackheath and Woolwich battalion) – presumably either pre-war or in the second or third-line unit. He was exempted from combatant service and was called up on 23 March and joined the 1st Eastern Company NCC. A month later he was in France. Munro served out the rest of the war doing labour work in the NCC in France. He spent most of the war serving in a detachment with the 19th (Western) Division on the Western Front, serving with them from November 1916 to May 1917 and again from October 1917 onwards. Unlike Cooper and Elsdon, Munro was apparently content with his role in the army – his disciplinary record is completely clean. 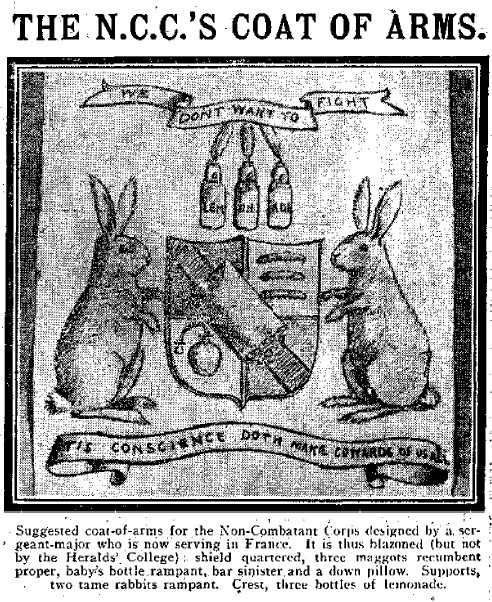 The Non-Combatant Corps was an attempt to give those who objected to taking human life a way to serve in the army. Many were allocated to it unthinkingly: those who objected to military service as a whole, either for religious or political reasons, simply could not countenance serving in even this unit. For some, though, it was an appropriate vehicle for them to serve their country when the law mandated that they should, without having to take direct part in the fighting. Other objectors took up work in the Royal Army Medical Corps in order to save lives rather than take them (just as many quakers had joined the Friends’ Ambulance Unit early in the war). Conscientious Objectors were a diverse group, including absolutists who fled or were arrested rather than serve and those who did labouring work for the Home Office well away from the military, as well as those who were content to serve in the military a non-combat role. If Military Service Tribunals have a negative public image, then the military representatives attending them have an even worse one – although perhaps slightly more deserved. Although not necessarily Blimpish zealots, they were there to argue the army’s case and often displayed offensive and bullying attitudes. 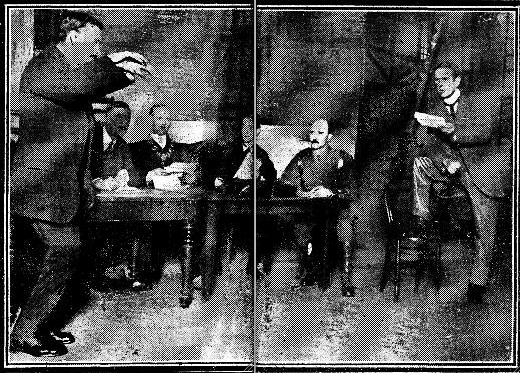 They were, however, another part of the civil-military body that was the tribunal – an odd position interestingly demonstrated by Alfred Eve, the military representative in Walthamstow. Alfred Eve was an electrical and mechanical engineer, born in 1861 in Kent. In 1887, living in Homerton, he married his next-door neighbour Alice H Mote; the couple had eight children. In the 1911 census the 7 surviving children (6 sons and one young daughter) were living with Alfred and Alice in their house at 25 Greenleaf Road, Walthamstow. By 1914, Alfred Eve was also a councillor for the Hoe Street ward on the local urban district council. Following eight years of youthful service in the East London Engineers, the Great War brought Alfred back into uniform. He became the recruiting and organising officer for Walthamstow and Chingford. He was granted an army commission in October 1914. In that year, he has response – as recruiting officer – for recruiting 350 men into the 1/7th Essex Regiment (the Walthamstow Territorial battalion) and 500 into the 2/6th (the second line of the West Ham battalion). In 1915, he brought in 800 to the 3/7th Essex, 2,500 into the 2/6th, and another 3,200 into London Regt (according to the Walthamstow Gazette, 7/12/17). In June 1915 he became a Captain and was put in command of a company of the 2/6th Essex. When the military service tribunals were established in early 1916, military representatives were appointed to examine each case and to argue the military’s case. Many did this with vigour and agdressively cross-examined and criticised appellants, although most still tried to balance the needs of the local community and those of the armed forces. Most ‘military representatives’ were not military men in peacetime, they were described in Parliament as ‘charming men… nine out of ten of them being solicitors in khaki’ (House of Lords Hansard 12/4/16). Indeed the two military representatives who served Eat Ham in 1916-18 were solicitors, as was the military representative for the Essex Appeal Tribunal that heard appeals against local tribunal judgements in Walthamstow, East Ham and other areas that were then part of Essex. Many though, like Alfred Eve, had had experience in the Territorials or their predecessor force the Volunteers. Captain Eve was forcefully in favour of pursuing the war to a conclusion. He was an advocate of the anti-German policies of the British Empire Union. He was also a hard-working military representative. Councillor Wilkes said he thought perhaps appellant might be better employed on munitions work than in doing C1 work in the Army. Captain Eve: We are here to find the men for the Army. The Chairman: No. We are here to see that the rights of the civil population are respected and that no injustice is done. If a man can show a good case for exemption it is our duty to give it. If you don’t fall in with our view it is your duty to appeal against our decision and the Appeal Tribunal will act as umpire between us. Captain Eve: I know my duty thoroughly, Mr. Chairman. The Chairman (to appellant): You have good grounds since you are the only support of your widowed mother and four children, three of whom go to school. Appellant was granted a fortnight in which to find work on munitions. Mr A.M. Lloyd, market gardener, Woodford Green, asked for [an exemption for] G.W. Taylor (C2), on the ground that he was doing work of national importance, among other things, they grew vegetables for the military hospitals. In the course of the hearing of the case the Chairman favoured the granting of the applications. The Military Representative [Capt. Eve] remarked that some applicants told “such tales”. Councillor Goodger: I’ll tell you what they can’t do, captain! The Miitary Representative (eagerly): What’s that? Councillor Goodger: They can’t tell ‘em like you can! The Gallant Captain (nearly bursting with laughter): That’s done it. Six months [exemption granted to Taylor]. Despite his pro-military attitude, Eve was clearly seen as approachable though, as he complained in March 1917 that those appealing to the tribunal were calling at his house to discuss their cases, despite clear instruction in their paperwork telling them to address them to the recruiting office. Like other military representatives, Eve investigated the rumours of shirkers working in local factories instead of serving their country. When people – including other tribunal members – complained that the local Xlonite Works were holding back fit men of military age, Eve an his assistant (Lieut Paine) went to visit the factory. They found that there were indeed youths there, but that they were 16 and 17-year-olds not liable for conscription yet. Much maligned though they were – often rightly given the aggressive attitudes some took – the military representatives played an important role in wartime recruitment alongside the other tribunal members. Their role was also unpaid, so involved a sacrifice on their part – fittingly given that they were calling for younger men to make such great sacrifices. In addition to this, Alfred Eve forwent his chance of becoming chairman of the council in 1917 due to the potential clash with his existing tribunal role (the chairman usually chaired the meetings, which he could not have done as military representative). When we read about the bravery of nurses in air raids, it can be easy to underestimate the danger they were in. These raids on hospitals could be enormously destructive, and of course the patients were often immobile in the face of that danger. The coolness and bravery of the nurses must have been a real benefit. One of those who could not be saved, though, was Stewart Arkcoll Gabriel. Stewart Arkcoll Gabriel was born in June 1878, the son of merchant James Sutcliffe Gabriel (who owned and ran a wharf) and his wife Susan (nee Arkcoll), the middle son and one of six children. The Gabriels lived in a large house on Leigham Court Road in Streatham. By 1901, Stewart Gabriel, still living at home, was working for his father. In 1905, Stewart was granted the freedom of the City of London as the son of an existing freeman in the Company of Goldsmiths. In 1906, Stewart Gabriel married Elsie Dorothy Thornton in Forest Gate. By 1914, though, Stewart they were living in Epsom, Surrey, with their daughter Judith Ashley Gabriel (born in July 1913). In March 1915, Stewart enlisted in the army, giving his profession as Dog Breeder. His entry on de Ruvigny’s Roll of Honour states that his defective eyesight meant that he could serve. In fact, the army doctors thought his eyesight (although poor) was good enough for service. He was rejected anyway in March 1915 and returned to civilian life. He was eventually conscripted in November 1916 and sent into the Royal Garrison Artillery – not exactly the kind of job he had been after in 1915 and certainly not one that would keep him at home in England. After going out to the front in April 1917, he was wounded but soon returned to his unit – 76th Siege Battery RGA. The Battery served around Ypres during the Third Battle there, now better known as Passchendaele. 47 Casualty Clearing Station bombed: Miss Roy, QAIMNS, Sister-in-Charge to say that her Station had been bombed last night, several bombs falling near the lines for walking cases and several of them were injured; one of the Sisters, Miss W. M. Hawkins, TFNS, was injured in the left thigh and would be evacuated to the Base by the next Ambulance train with 4 other Sisters suffering from shock. Altogether there were about 50 casualties, 12 of whom have died, including one RAMC orderly. One of those 12 fatalities was Stewart Arkcol Gabriel. He was buried at the local military cemetery, one of over three thousand British and Empire casualties buried there. The Epsom and Ewell History Explorer website has a photo of his headstone at Dozinghem. Elsie Dorothy Gabriel lived another 30 years, until October 1948; their daughter Judith married in 1940 and lived until 1986. Gabriel’s story is unusual both for the manner of his (brief) early period in the army and for the manner of his death. In the end though, he was just one of the many men who were conscripted in 1916-18 and left their families behind, and sadly one of those men who never returned. 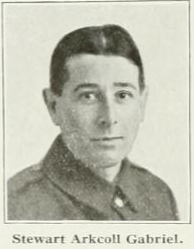 Just one among the millions of men who were conscripted into the British Army in the latter years of the Great War was Frank Leslie Berry, a clerk who ended up making maps on the Western Front and being gassed in the final weeks of the war. Frank Leslie Berry was born in February 1899. By the start of 1917, he was working as a junior clerk in the Ministry of Munitions in Whitehall and living at 49 Ledbury Road, North Kensington with his father Thomas. As a young, single man, he was called up into the army as soon as he turned 18 – joining up at the start of March 1917. Berry was recruited into the Royal Engineers and trained to be a field linesman in their signals section. A year later, he arrived in France (in March 1918) and was posted to the 5th Field Survey Company. These were the organisations – well described (as ever) on the Long, long trail website – that produced the maps that the army used in trench warfare. Following the German Spring Offensive that was launched in the weeks after Berry arrived in France, the Allies gradually turned the tables and began to push back the German Armies on the Western Front. When he began to feel these effects, he reported to 53 Casualty Clearing Station (which probably locates his unit to Roisel, Northern France). From there he was sent to No 1 Australian General Hospital, then based at the Racecourse in Rouen. Sent back to the UK, he was sent to the Huddersfield War Hospital and the Denby Dale Auxiliary Hospital, also in Huddersfield. He was deemed to have recovered in January, but suffered a relapse in February. On 19 February he was demobilised and returned home.